I found this race in the local, free running magazine, Run Washington. One of the great things about living in such a dense, metropolitan area is the multitude of resources available to niche groups. One of the downsides is all the people. But I digress. This 5k is held in Centreville, about a half hour drive from where we live. My roomie, Emily, wanted to do the race with me. Race day goal number one was to wake her up early enough for us to drive to Centreville, pick up our race packets, and warm up (she's not usually an early riser). 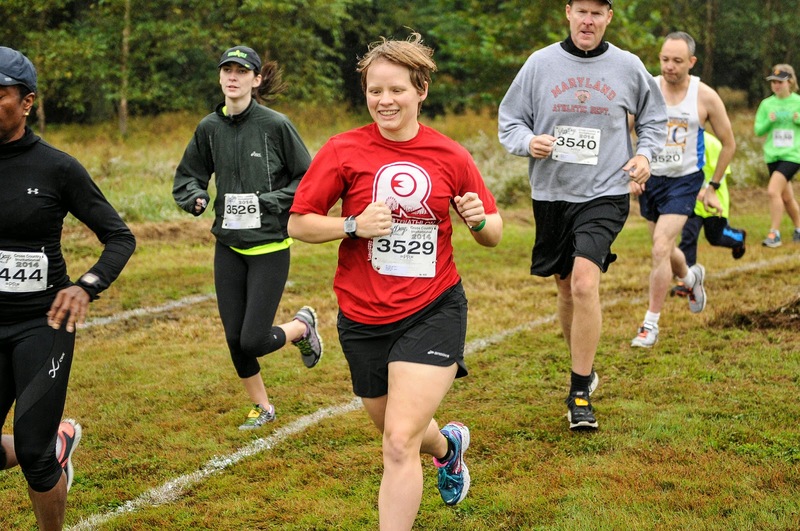 The day was cloudy, cool, and rainy, which I consider perfect weather for an October XC race. We got lost trying to find packet pick-up, because I trusted GPS for directions over e-mailed instructions from the race directors. I really need to ween myself off of Google Maps. When we pulled in to park, I realized (thanks to the signs warning that XC meet parking would be $5) that this race is held as part of a larger high school XC invitational. I love watching high school and college XC meets, so I was excited to (almost, kind of) be a part of one. Packet pick-up included a very nice, day-glo yellow, dry-fit T-shirt and a commemorative race pin. Not bad, although the entry fee was more than I'm used to for a 5k ($35). There were a beautifully excessive number of porta-johns at the race site. It was one of the most beautiful things I've ever seen. I made use of them multiple times before, during, and after my warm-up. I'd had a lot of water (and maybe a beer or two) the night before. During my warm-up, I noticed a stocky, Asian woman about my age. She wore running shorts with a matching singlet, and held herself in a--how do I put this delicately?--gay way. I'm serious. She was clearly a lesbian. I'd found my nemesis (please note that this was because of her age, not her supposed sexual preferences). We got to line up in the staging area for the race. I bounced around, trying to stay warm, like a happy bunny while Emily stood staring at me sullenly. She still wasn't quite awake. We finally got the call to take our marks, then we were off. I held back in the first 150 meters, letting the faster runners go in front of me. Most of the first quarter mile went downhill, and I enjoyed stretching my legs out. The race was laid out in three loops, each about a mile long. I imagine that's because the high school races are run at different lengths for different groups. The ground was soft, not too muddy, although there were a few sloppy puddles that we all had to run around. There were a few short climbs, and some absolutely brutal long ones. It was a cool course, and I enjoyed it. I started off at a comfortable pace, and ramped it up through the first lap. I passed a lot of people, including my nemesis, within the first mile. I never saw my nemesis again, either, so I did not choose well in terms of race-long motivation. The second mile took a lot out of me; it was mostly uphill, and some of the hills were quite steep. I made up as much time as possible on the downhills, and I was getting passed now and then. There was a little boy who looked about seven who ran right past me. He stayed within reach the whole time, but the one time I tried to pass him, he put on a little kick and kept me away. What a competitor! One woman, a short, slight, black woman whom I passed in the first mile, came back to me somewhere around the end of mile 2. She passed me, but I kept her within reach. I passed her back on a long, downhill section, but she was able to stay in touch, too. I gradually ramped up my pace to try and drop her, but she kept with me. Finally, I had given all I could at that faster pace, and I had to pull back. She passed me and ran off. It was great, though! It felt like I was actually racing someone, and she definitely pushed me to run faster than I would have run without her! I crossed the line in 27:57, and felt like I'd given all that I could. I used this race as a measurement tool. I've done slow, zone 2 running almost exclusively this year. My 10k times in my olympic races have been upwards of an hour, and my half marathon time at Rev3 Cedar Point . . . I don't even want to talk about it. I haven't trained myself for hard, fast running, and I've kind of forgotten how to push myself to that level of pain. So I wanted to get a reading on how fast I could run a short race, at this point. I exceeded my expectations. I was really hoping to be able to run in the low nines, and I managed to run almost exactly nine-minute-miles at this race, on a challenging course and off-road, no less! I'm very happy with my performance. I won 2nd in my age group (F25-29, taking into account that two of the top three overall women were in my age group), and my time would have placed me well in the 30-something categories, too. The 40-somethings, though, were all 21 minutes in change. I would have been way out of contention if I were 20 years older! Isn't that amazing? 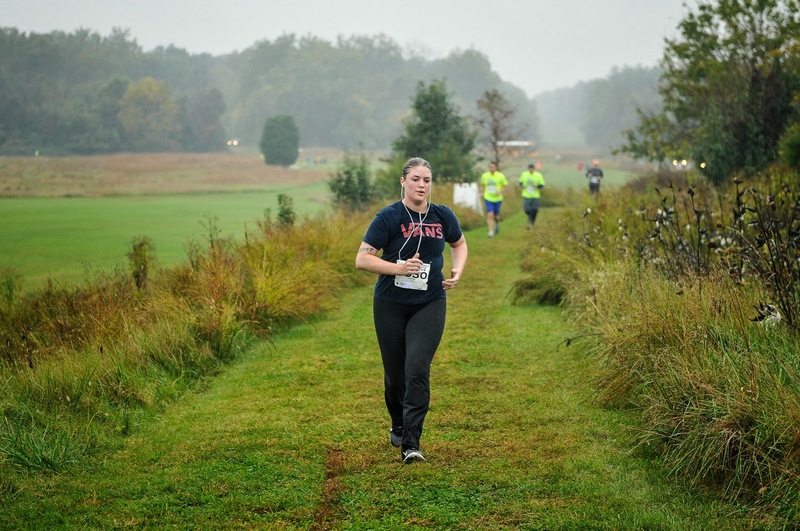 I was really happy with this course, the organization, the race amenities (the pictures they took are amazing, and free! ), and the atmosphere of the race. Something about going off-road seems to make people a little more laid-back; I've noticed it at XC races and at CX (cyclo-cross) races. There was none of the preening that I've seen at other races and from other athletes (cough, triathletes, cough), and there's no high-tech or expensive gear to show off. I think XC and CX races might be my favorites. By the way, Emily finished in 33:38 in her first 5k, her first XC race, and her second event ever!